Game of Thrones : Live Concert Experience — Always Packed for Adventure! Dan took me on a surprise date night and bought last-minute tickets for us to see the Game of Thrones: Live Concert Experience at the Moda Center in Portland. We didn't realize it at the time, but we were seeing the last night of the tour, with made stops in twenty-four major cities. This was our first time visiting the Moda Center, which is the home of the Portland Trailblazers. Living in downtown, it was just a short train ride to the Moda Center. When I lived in Los Angeles, I tried taking the train to the Staples Center for a Taylor Swift concert and it was a complete disaster. The trains in Portland are much more efficient. Each trip was about twenty minutes, including the walk time to/from the stations. It was easier and much cheaper, than if we had decided to drive. We had about thirty minutes to kill before the concert began, so we walked a majority of the interior perimeter of the Moda Center, trying to find a Game of Thrones prop and costume exhibit. I guess we didn't walk far enough before giving up, because I've since seen pictures of what we missed, like the Iron Throne. Darn! We saw a huge queue at a green screen photo spot, which would have been fun too. Instead, we had a pre-concert cider. A panorama of the arena. It was approximately 2/3rd full, with the very top section completely blocked off. Hey look, it's us on our date night! 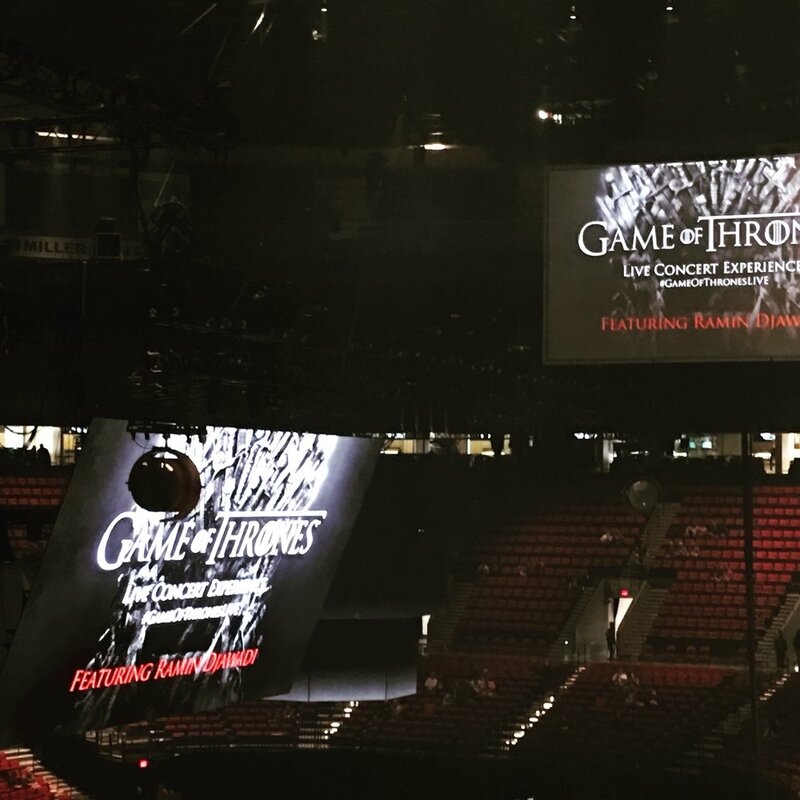 Ramin Djawadi, the composer for Game of Thrones, was the one who dreamed up this tour. 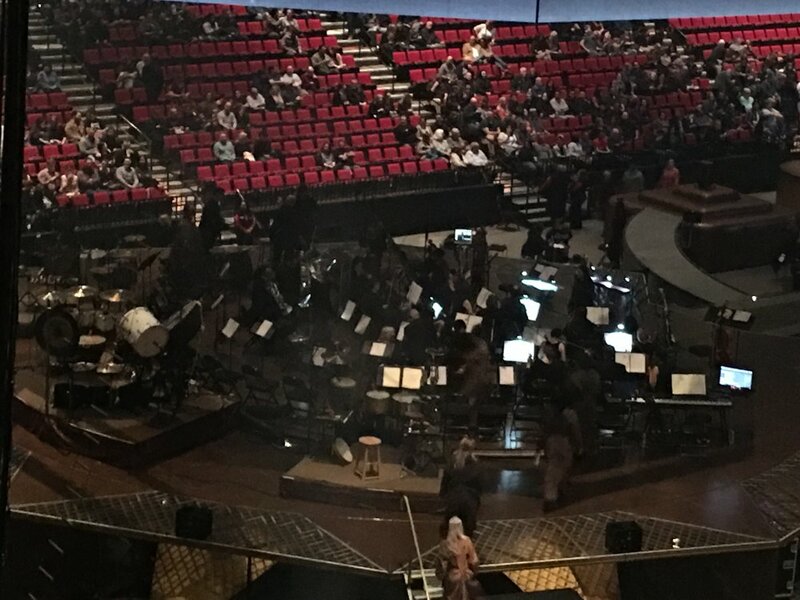 It featured Djawadi conducting an eighty- piece orchestra and choir against the backdrop of clips from the show with special effects. I've watched the entire series ( thus far), but to be honest, I couldn't recall any music except for the theme. During the concert, I was reminded of music that I knew from the show, but never really thought about, it must have been tucked in my mind somewhere. Djwadi's score is beautiful and diverse. Game of Thrones is such a grand production, that it's rare to have a chance to appreciate its parts, such as the music. Speaking of grand, let's talk about the special effects for the Game of Thrones: Live Concert Experience - they were kind of distracting. I understand that by tacking on the word "experience," the audience is going to set the bar a little higher than a regular orchestral concert, however the experience part was a little odd. The stage had fire blasts for a few songs and some low-level sparkler fireworks shooting upwards as a replica of the Iron Throne rose from beneath the stage. They also had a little smoke, and at one point, confetti to mimic leaves falling from a tree. The oddest thing was this rather cool reflective/mirror, that casted beams of light, but that was only used once. The should have either done more with the special effects or eliminated them. The video graphics were mostly very good. I liked seeing the scenes that accompanied the music, as it gave context. However, the screen closest to us, was not aligned properly, creating blurry and cut-off images. I kept having to look at a screen that was much further away. It would have looked fabulous, had it been properly installed. Perhaps something was wrong with it and they either, didn't have time to fix it, or didn't want to bother with it, since it was the final night? Here's a picture of it- the screen I'm talking about it on the left. This picture is not a good example, as what is displayed basically looks okay, but when moving images were shown, it looked terrible. The show had one intermission and they used the screen to count-down the twenty minutes. The tour utilized a core group of musicians, but also filled in with local artists. For the encore, the primary musicians played an upbeat song, while a memorium clip played a tribute to all of the characters who have died, in order of their deaths. Game of Thrones has had a lot of death! Djawadi and his musicians are all insanely talented and they put on a high-energy, amazing show. However, my favorite part of the night was before the show started, and we got an announcement from Cersei Lannister, in what sounded like a voice-over performed by Lena Headey herself, explaining the rules. I don't remember the exact words, but her punishment for those with ringing cell phones was "Boiled alive in the blood of your children." It couldn't have been a more perfect way to open the show!